Sometimes a little pick-me-up is all you need to keep you focused though out the week. The best way to soothe your soul is to end the day with some home cooked comfort food. This recipe is a fun spin on a classic that everyone knows and loves. 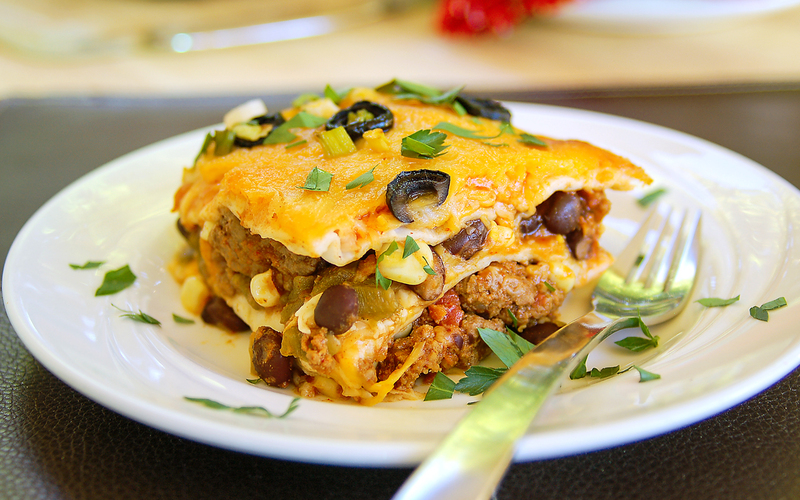 Dinner goes south of the border with this Mexican lasagna recipe that is sure to be a hit. Preheat a large skillet over medium high heat. Add 2 tablespoons of extra-virgin olive oil in the pan. Add chicken and season with chili powder, cumin, and red onion. Brown the meat for 5 minutes. Add taco sauce or stewed or fire roasted tomatoes. Add black beans and corn. Heat the mixture thoroughly, 2 to 3 minutes and then season with salt and pepper to taste. Coat a shallow baking dish with remaining olive oil, about 1 tablespoon. Cut the tortillas in half or quarters to make them easy to layer. Build lasagna in layers of meat and beans, then tortillas, then cheese. Repeat: meat, tortilla, cheese. Bake for 12 to 15 minutes until cheese is bubbly. Top with scallions and serve!